Written by Colin Nederkoorn on February 11, 2016 . We’ve begun a process that will make Customer.io’s triggered campaigns easier to understand and safer yet more powerful. 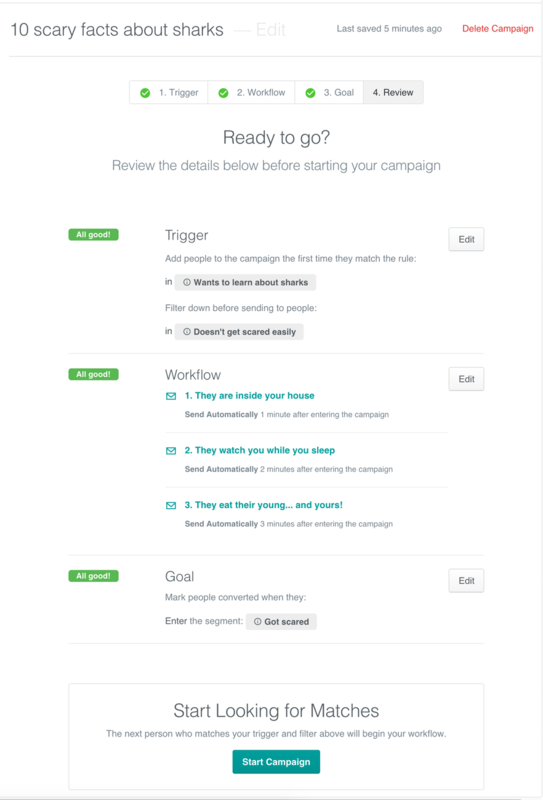 The first step we’ve taken is to give you a guided process for creating a new triggered campaign. The concepts are the same, but we split the process into 4 steps: In each step, we refined the interactions to make it clearer that there’s a beginning and an end when you’re creating a campaign. One new addition is when you create a campaign now, we won’t start looking for people to send (or draft) a message until you tell us to start. Once you’ve started your campaign, you’ll notice a new horizontal navigation (instead of the chunkier old vertical nav) that frees up space on the page for you to focus on your campaign. We think you’re going to love these improvements. We’ve got big plans for campaigns this year and would love to know what you’re looking for next from triggered campaigns. Send us your thoughts and questions at win@customer.io or @customerio!